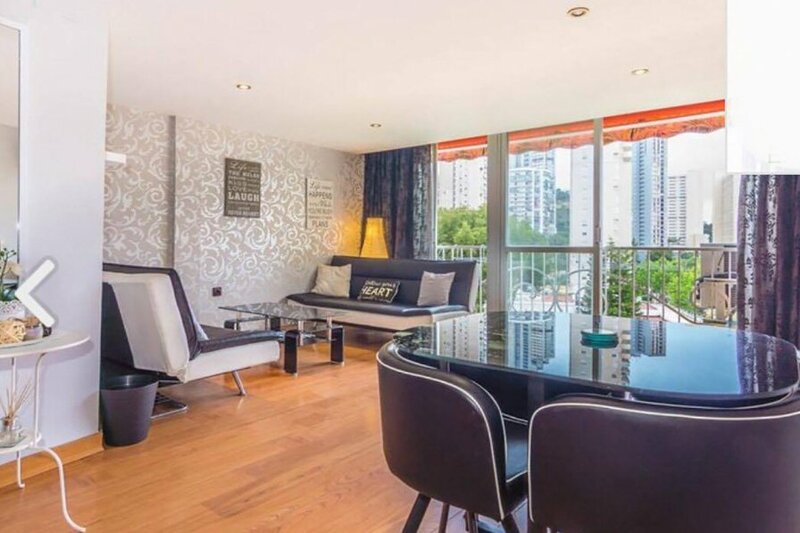 This 2 bedroom apartment with shared pool is located in Benidorm and sleeps 7 people. It has WiFi and air conditioning. Take a look at this luxury 2 bedroom holiday rental apartment located in the Rincon de Loix area of Benidorm. The reformed property is located in Edificio Playmon Park , Block A complex, and sleeps upto 5 people. The apartment has 2 Bedrooms, 1 twin Bedroom and 1 single Bedroom with additional sleeping arrangements of two large sofa beds in the spacious Lounge. Reformed to a very high standard and with chic fixtures and furnishings the apartment has a fully fitted Kitchen with oven, hob, fridge freezer and microwave . The Lounge overlooks the fantastic garden areas of the complex with amazing views. The property has a modern fitted Shower room, and is well equipped for holiday rentals. Guests can access WIFI and UK TV included in the rental, air- conditioning charges apply, and the large communal pool seasonal opening times apply, garden and picnic areas and a children's park.